When I first saw this picture in the giant pile of albums, frames, envelopes, and books I liberated from my mother’s house, my first reaction was, “WOW!” Initially, I had no idea who he was because I had only seen photographs of him as an older man, but as I studied his eyes, there was no question. This was a photograph of my great grandfather, William Stewart Dinwiddie. 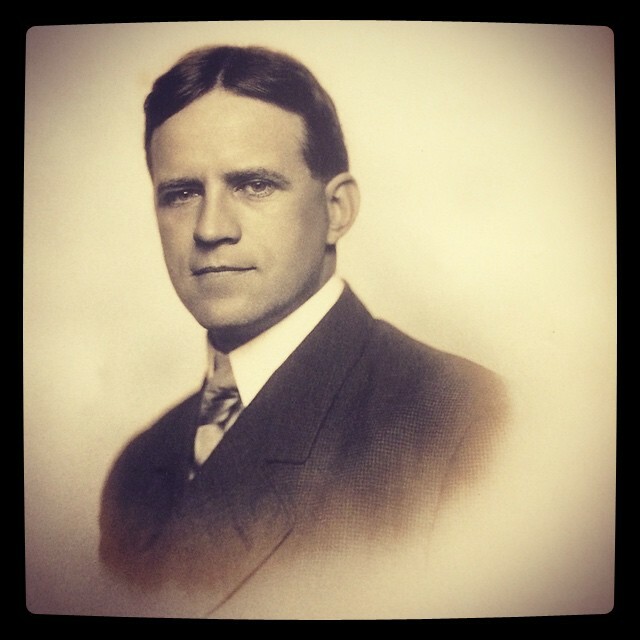 I didn’t know much about my great grandfather, other than he had started a construction company in Portland, Oregon in the early twentieth century. There were a few photographs of him in the boxes, and each time I came across another one, the more interested I became in him. Since my he never wrote a tell-all autobiography filled with photographs and juicy family stories, I’ve had to collect bits and pieces from different sources, verify their authenticity, and search for as many details as possible to add to it and back it all up. Unless I see the primary source, I committed nothing in pen until it could be verified. When he was 16, Bill (as my grandfather said that his father was was now called) was sent off to boarding school at Staunton Military Academy in Staunton, Virginia. I contacted the Alumni Association for the 116 year old school (which closed in 1976 but still has a somewhat active alumni association) to see if they’ve got anything on William Dinwiddie from his time there. Unfortunately, everything from their early years was destroyed in a fire. According to my grandfather’s speech, Bill enjoyed playing baseball while at Staunton. The school’s diamond was just a flat pasture, and when the boys wanted to play, they’d just run the cows off and take over the field. When Bill inquired about tryouts for the team, he was enthusiastically accepted, without tryout, and assigned to center field. He figured out why they were so excited when he took his position and realized that a glove wasn’t necessary—just something with which to wipe off the ball if it got to him. 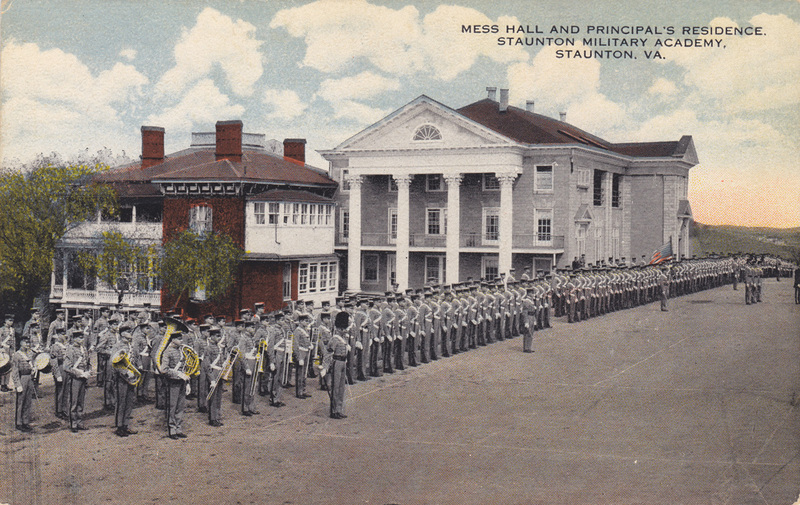 Winters at Staunton Military Academy were pretty cold in 1887. Each student had a wood-burning stove in his room, and they were all required to find, cut, and carry their own wood. Bill quickly discovered that he was cutting and carrying a lot more wood than he was burning, but nothing was accumulating in his room. Being the trouble-making prankster he was, he conjured up a way to “out” the wood thief. He bored a small hole into the end of one of his logs, poured in a little gunpowder, plugged the hole, returned it to his pile, and waited. Once the smoke cleared, he—and everyone else—learned the wood thief’s identity. I’m not sure if this stunt caused his expulsion from Staunton or if he went on to graduate– no records! There’s nothing in our family archives, and, like I said before, the school has no records from the 1880s. If Bill’s antics caused his expulsion from Staunton, if he went on to graduate, or if my grandfather simply jumped forward in his speech, I can’t say. Regardless, the next place we find him is on his way to the Windy City. 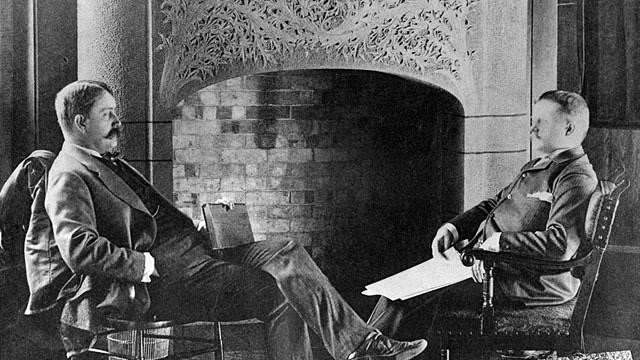 Daniel Burnham and John Root in a famous photograph of the pair in their Chicago office library in The Rookery Building (photo from the Chicago History Museum). The two founded Burnham & Root, one of Chicago’s most famous architectural companies of the 19th century. It was at their firm in Chicago where Bill landed his first job and began his career. 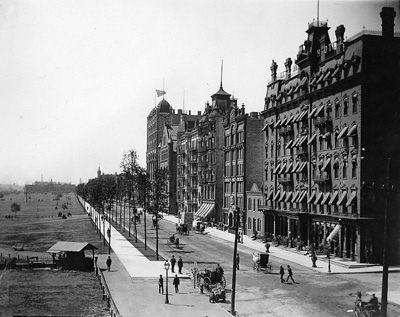 In the late 1800s, something amazing was happening in Chicago. Two young men, Daniel H. Burnham and John W. Root, opened their own architecture firm, Burnham & Root. Though they began by building residences for Chicago’s elite, the most important work they were doing was paving the way for the modern skyscraper. Bill’s older brother, Jim, was among the draftsmen in their tutelage, as were two brothers from Kansas named Theodore and Paul Starrett. Jim had landed an apprentice draftsman job for his little brother. Two vintage photographs of Chicago taken at about the time he arrived in the city for the first time. As a naïve kid from the sticks in Tennessee, it had never occurred to Bill to ask his brother where in Chicago he should go. Bill had never been to a big city before. When arrived, he jumped in a cab and told the driver to take him to see Jim Dinwiddie. The cabdriver, not really know what to do with this information, suggested that they just drive around until they saw him. 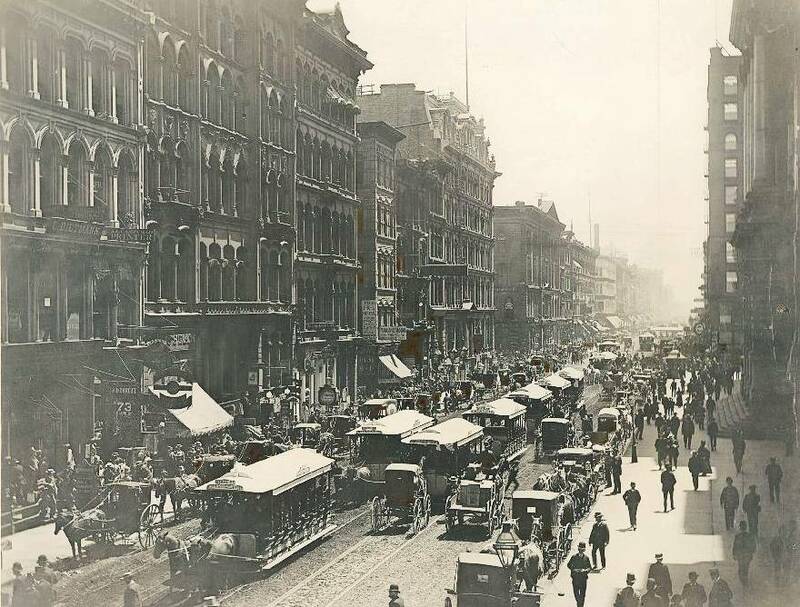 A vintage photograph of La Salle Street in Chicago from 1888 and a vintage photograph of The Rookery Building the same year. The Burnham & Root offices were located in this building that they built, so the timing fits that Bill’s first job as a draftsman would’ve been in this building, possibly on the top floor. For the next five years, the Dinwiddie and Starrett brothers worked on the first skyscrapers in the world with Burnham & Root. As Daniel Burnham’s protogees, they learned the art of building, and they all started at the bottom and worked their way up. Little did they know that all of them, both together and each separately, were destined to change the face of the world. An illustration from the DVD “Make No Little Plans: Daniel Burnham and the American City.” It depicts Daniel Burnham (center) with many draftsmen and architects in the background. Although the illustration is (likely) fictional, the timing is right that Bill would have been one of the men behind him. What is not written in William Aiken Starrett’s memoirs is something that I can only assume—the Starrett brothers must have also been good friends with Jim and Bill Dinwiddie. I confidently make this assumption because on the evening of September 12, 1895, William Stewart Dinwiddie married the Starrett brothers’ sister, Helen. 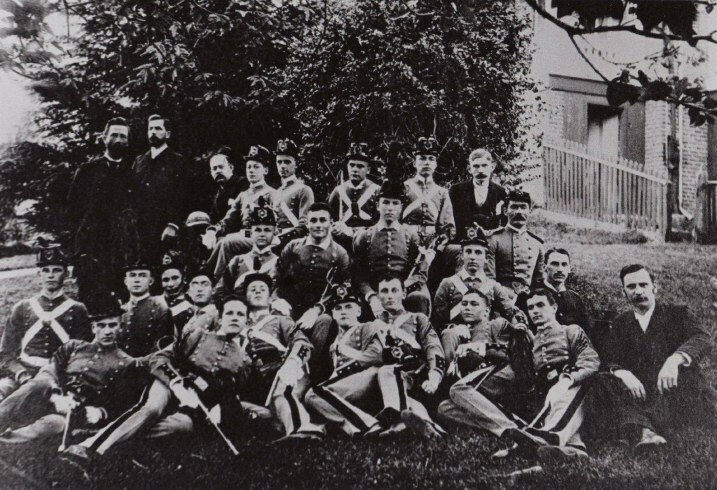 The ceremony took place in one of the large parlors of Mrs Helen Ekin Starrett’s Oak Park, Illinois home with William and Goldwyn Starrett as Bill’s groomsmen. In front of about sixty guests and surrounded by white asters, field daisies, and goldenrod, the two exchanged vows before starting their new life together. Their first place of residence would be Plaquemine, Louisiana, where Bill would work for about six years as a civil engineer and architect for the United States Army Corps of Engineers.